Whether you are planning a corporate event, fundraiser, wedding, holiday party or any other event, theme parties are a wonderful way to spice things up. 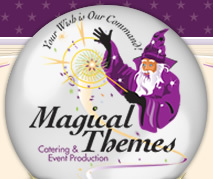 When Magical Theme Catering & Event Production handles your event, you can sit back, relax and enjoy being a guest at your own party. From full-service catered menus, to live entertainment and decor, we offer an experience that will enchant your guests and create memories to last a lifetime. Whatever the occasion our team of professionals will bring your vision to life.